The ESS 3-Day Executive Protection Training in Florida January 8-10 is designed for beginners and industry veterans who need a refresher. This is also a GI Bill Approved Executive Protection Training – D.O.E. and VA Approved Bodyguard Training in Tampa from ESS Global. Covering all the basic pillars of executive protection, this intensive 3-day training will provide you with the basic knowledge and protection techniques commonly used by the Secret Service, State Police, Highway Patrols, VIP and Dignitary Protection Units responsible for protecting politicians and other domestic and foreign dignitaries around the world. Our ESS Global Executive Protection Training is designed as a “must-have” for beginners in the world of executive/close protection, as well as a “refresher” for career veterans in the protection industry . This D.O.E. Certified Executive Protection Training gives you a strong start in the security industry covering city, county and state government organizations, corporate security services, security agencies and private individuals. And it’s the only security training in the entire state of Florida that has been vetted and approved by the D.O.E. ESS Global uses proven methodology, derived from current and past protective security operations, security consulting and of course, security training, in over 60 countries around the world. These operations have been conducted in threat environments ranging from “negligible” to “imminent”. ESS Global Corp executive protection training is taught by elite executive protection professionals who have unmatched knowledge and experience in the Executive Protection Industry. ESS Global Corp is the only Executive Protection School in Florida Approved by the Department of Education. 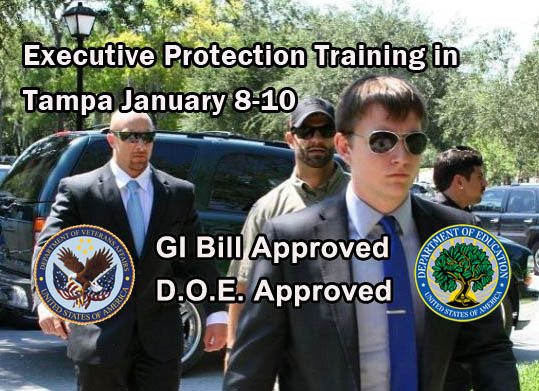 ESS Global Corp is the only Executive Protection School in Florida that is Approved to Accept GI Bill Benefits. ESS Global Corp is the only Executive Protection School in Florida Approved to Accept VA Voc Rehab. If you are serious about the executive Protection industry, choose a serious school, ESS Global. Join Us for Our Next Executive Protection Training in Tampa (MAP). Access our calendar of events. Posted in ESS Global Corp, news, school, training, updates and tagged bodyguard training florida, bodyguard training tampa, close protection training florida, close protection training tampa, ESS Global Corp, executive protection classes florida, executive protection training florida, executive protection training tampa, Florida, GI bill approved bodyguard training tampa, gi bill approved close protection training tamap, GI bill approves executive protection training training tampa, Tampa.